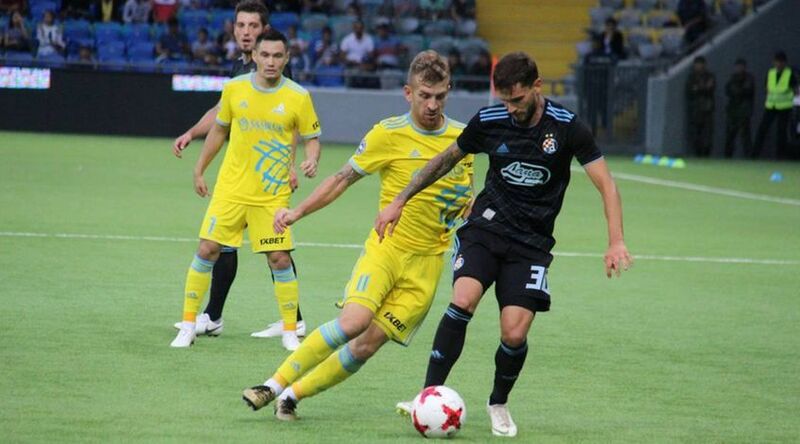 ASTANA — FC Astana and Ukraine’s Dinamo Kyiv ended their first match of the UEFA Europa League group stage with a 2:2 draw. The match was challenging for Astana as Dinamo Kyiv is the group’s favourite team and Ukraine’s most titled team. Dinamo’s forward Viktor Tsygankov scored first on a pass from Vitaliy Buyalskyi. Ten minutes later, Astana’s defender Marin Anichic sent the ball into the goal by the head thus equalising the score. The Ukrainian team was ahead after the first half as Dinamo’s player Denis Germash scored the second goal 1:2. The goal was assisted by a mistake by Astana goalkeeper Nenad Eric. In the 4th minute of extra time, Astana player Roman Murtazayev tied the score at 2:2. Thus, FC Astana earns the first point in the UEFA Europe League group stage of this season. “We warned the players of much pressure from first minutes. And it is a pity we conceded a goal in the 11th minute. We managed to take the lead as we levelled the score in addition to many chances to score goals. The second half we needed to be more active, move forward, as we were not content with the score. We performed several counterattacks, and fortunately, the team could gain its first point in Kyiv,” said Astana Head Coach Grigori Babayan. “We should be content with a draw in an away match. The match turned out to be interesting with many goals. We conceded a goal because of the mistake; however, it is football, and we should move forward. Good thing that we levelled the score. I think a draw is a good result,” said Astana’s captain and goalkeeper Nenad Eric. Astana will face France’s Rennes in the next UEFA Europe League match Oct. 4 at Astana Arena.